Note: This page contains all 25 places to visit in Jodhpur. If you are in hurry (like 1-day-tour) read these 10 Jodhpur tourist attractions. First, they identify the Tourist Attractions of Jodhpur that they would like to visit. Second, they put 100% of their resources into exploring and enjoying those places. Well today I am going to make it easy for you. All you need to do is take out a few minutes of your day and visit one of the 25 places to visit in Jodhpur below. I have included a section Named WIIFY (what’s in it for you) for every place. This will make it clear what you can expect from that place. Udai Mandir is an architectural beauty. If you are an appreciator of architectural brilliance and quality then this place is for you. Half of the temple entrance gate is made from the carved sandstone (Jodhpur is the hub of sandstone). The main temple stands on a huge raised platform and is supported by 102 pillars. Inside Udai Mandir there are beautiful wall paintings with 84 Yogasanas and the pictures of Nath Yogis made up with gold. The temple has a Garbh Griha. The upper portion of the Garbh Griha is kept covered with cloth and is surrounded by gold pots. The gold polishing in Udai Mandir still has its original shine and quality. I am sure you cannot afford to miss this one. You get to know the real old Jodhpur. 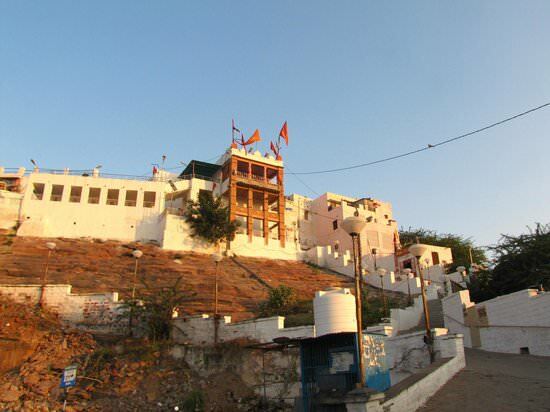 Siddhanth Shiv temple is situated between Takhat Sagar hills and Kalyana Lake. Its way is on Chopasani Road and it is about 10 Kms away from Jodhpur. You can reach the temple only after crossing the hundreds of stairs made up by cutting rocks. Once upon a time the place, exactly where the temple now stands, was completely a deserted area. Siddhanth Shiv temple is believed to be built by GauriShanker (also called Nepali Baba, his real name was Veetragi Narain Swami) himself by cutting stones. He was a handicapped saint who had only four fingers in each of his hand and foot. This place is quite and has natural air in it. Since it is on hills you will get clear view of natural beauty of Jodhpur and Machiya Safari Park (which is nearby to it). You there are natural scenes you can click amazing photographs. This place has been featured in a documentary of DD National (National TV channel of India) around three years ago. You should repeat the mantra ‘Bham Bham Bhole here’. Masuria hill garden is located on the Masuria hills of Jodhpur. It has the Asia’s largest TV tower in it. It is green lush garden with full and clear view of Jodhpur. Earlier Mehrangarh fort was proposed to be made on Masuria hills but due to lack of water (at that time) Mehrangarh was made where it is at present. A stone statue of Rao Jodha with his horse is located in the garden. Asia’s largest TV tower ‘Masuria Tower of DD national India’ is located in the garden. It is the center hill of Jodhpur. You have best Jodhpur photograph opportunity here. Full view of every part of Jodhpur is clearly visible. Arna-Jharna is a unique to approach to the way museums should be. Instead of being enclosed in a box, it enjoys the open space of the desert. Here you learn by exploring and enjoying with visuals. It’s a place to learn about various traditions followed in music, various instruments used and how they came to be. The famous & colorful puppets of Rajasthan are on display. The location is very refreshing and gives you an look of a Desert. Carry your mineral water and some snacks for the journey. Best time to visit would be after breakfast so you can return back to the hotel for Lunch. School going children can learn and enjoy a lot from this place. They have created a clean and a nice ambiance of village and have Villagers home like structures that House the cultural belongings. They have a collection from Puppets to Musical Instruments to Brooms and to grasses of Jodhpur and nearby places. Real opportunities for photographers to click away the museum. Unique in its own way, you will hardly find places like this. Mehrangarh Fort of Jodhpur is one of the largest and most popular forts in India. The fort is located at the centre of the city and appears to command Jodhpur. Every visit to Mehrangarh is as exciting as before. You will love to do the Flying Fox, it’s very exciting experience. Its architecture is fascinating and contains the work of artists of over 500 centuries. It contains two ancient temples of Jodhpur. It contains painting of Marwari style of Rajasthan. You will see every part of Jodhpur culture in the articles displayed. The museum houses an outstanding collection of fine and applied arts from the Mughal period of Indian history. Here is the chance for photographers to capture stunning views of whole Jodhpur from one place. At the gate you will be welcomed by musicians playing folk song. You will get tourist friendly facilities like audio guides, a lift to the top. To know more read this article on Mehrangarh Fort. Jaswant Thada lies to the left of the Mehrangarh fort complex. 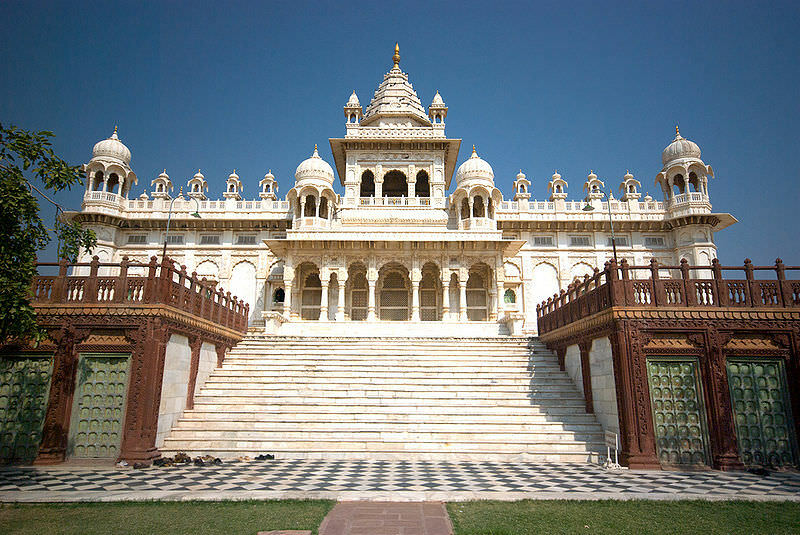 It is a royal memorial made up of white marble and wonderful architecture piece of art. It has wonderful architecture, some stones are extremely thin and polished such that they emit a warm glow when the sun’s rays dance across their surface. Some rare portraits of the former rulers of Jodhpur are displayed in Jaswant Thada. The lawn in the garden is neat and clean with a nice fountains and flowers. You can chill and relax here freely. Rao Jodha Desert Rock Park was created in 2006 and is situated next to Mehrangarh Fort. There are plants in this park that are adapted to growing in arid, rocky areas of the Thar Desert. Rao Jodha Park is open throughout the year from 9 AM to 5:15 PM every day. Entry Fees for Adults: Rs. 50, Students Rs. 10, Guided Walks Rs. 100 and entry for children aged 15 and below is FREE. It is different from every other park of Jodhpur because of the fact that it is a type of Rock and Desert Park. A large variety of Plants and Trees. It is a place to take photographs of natural beauty. It’s an excellent way to learn about the geology, geography, flora & fauna of the region. Just take a high value guide for ₹ 100 and he will answer your every question and show you the uses of the plants in food and medicines. This is a temple of great Hindu god and leader of the epic Ramayana ‘Shree Ram’. It is located in the Chandpole (near Soorsagar) of Jodhpur. Here the sages preach and practice principles of Hindu Dharma. Peace, confidence, spirituality and things to do for a great life are found here. This place is famous for a stone which filters every kind of water which passes through it. It is a miracle and many scientists has wanted to find out why? There is a real story behind it. They still have the stone. You should repeat the mantra ‘Jai Shree Ram’ here. Umaid Bhawan Palace is one of the world’s largest private residences. Taj Hotels manage a part of the palace. It was named after Maharaja Umaid Singh, grandfather of the present Maharaja Gaj Singh II, this monument has 347 rooms and serves as the principal residence of the Jodhpur royal family. A part of the palace has now been converted into a hotel and a museum. It has museum which focuses on the 20th century history of the Jodhpur. The opening hours of this museum are 9 am to 5 pm. It is a luxury hotel. Outside the museum is a vintage car collection which is worth viewing. Palace hosts a whole lot of birds, so some nice photographs could be taken. Ghanta Ghar also known as the clock tower. Beside the tower, there in the Sardar Market that is trusted by tourists for shopping. From this market, you can purchase Rajasthani textiles, clay articles, miniature camels and elephants, marble inlay work and classic silver and gold jewelry. Market place for traditional Jodhpur Articles and Jewelry. Tasty food stores around it. It is the best market for shopping in Jodhpur and reminds of the old times. The Sachiya Mata Temple is located in Osian, near Jodhpur. Osian is 60-65 kms from Jodhpur. In this Temple mother goddess Sachiya (Also called Indrani) is worshipped by many castes living in Rajasthan, Madhya Pradesh, and North India. She is “Kul Devi” (a protector goddess of a community) of many of well-known communities. This temple was built by the Parmar King Upendre for his “Kul Devi“ in the 9th to 10th century C.E. Clean and beggar free Temple. The crowd here is disciplined. The marble carvings and intricate work of temple are mind-blowing. There are 1000 snake statue and also elephants. You can click pictures of sculptures. In the way from Jodhpur to Jaisalmer, so it can be a part of your travel trip without much hastle. As we have talked in Jodhpur Food about Bada that they are a part of every winter festival and get-together. Bada of Osian are such a taste (Oh my god! water has come in my mouth J ) that you should experience here. The shop is near Bus Station at Osian near this temple. There are 9 different temples around for the Devi. These are prayed during Navratri festival (Navratri festival lasts for 9 days, 9 days for 9 Goddesses). You should repeat the mantra ‘Jai Mata Di’ here. This lake is a popular picnic spot of Jodhpur. It was built in 1159 AD by Balak Rao Parihar. It was constructed as a water reservoir to provide water to Mandore, the then capital of Jodhpur. The Balsamand Lake is surrounded by green gardens and has trees like mango, papaya, pomegranate, guava and plum. This place is home for animals and birds like the jackal and peacock. This place is perfect for natural beauty lovers and morning walk is refreshing here. Peacocks can be seen dancing in rainy season. Here is opportunity for photographers to capture natural scenes. It contains swimming pool for you to swim. Only people who stays in the hotel has access to all these. The Chamunda Mataji Temple is situated in the southern end of the Mehrangarh Fort. Chamunda Mata is worshipped by most of Jodhpur’s citizens and Kings themselves. During Dussehra celebrations, Mehrangarh Fort is frequently visited by Jodhpurites to get a glimpse of Chamunda Devi. You will get great view of the Jodhpur from this temple. Great architecture and marbel carvings. Wishes are believed to come true, so pray whole heartedly. This temple is well known in India. People from all over India come walking to the temple in Bhadwa Beej (A specific date in Indian Calender that is different in every year in English calendar but exact in Indian Calender). It is a well-known fact that after visiting Baba Ramdev Temple of Jodhpur if you visit Baba Ramdev Temple in Ramdevra, Jaisalmer; your every wish is fulfilled. Handicapped people, poor people promises Baba Ramdev certain numbers of repeated walk visits and after those their wishes come true. It is a great temple situated at Masuria Hills. You can sit here with peace of mind and you become worriless there. There is a sacred Kund (in Ramdevra, Jaisalmer) where all devotees take a bath to fulfill all their wishes and whenever you take a bath in this sacred pond your skin diseases get away from your body. You should repeat the mantra ‘Jai Baba Ri’ here. Om Banna Temple (also known Om Bana, Bullet Banna and Bullet baba Temple) is a temple located in Pali district near Jodhpur. It is located 20 Kms from Pali and 50 Kms. The motorcycle is a 350cc Royal Enfield Bullet. Om Bana, a local citizen, was riding the bike, it got unbalanced and hit the tree. He was dead immediately. Police took motorcycle in the police station but next day bike was found under the same tree. Even after numerous attempts to take bike away, bike was found at the same place under the tree where the accident happened. The bullet still lies there in an open enclosure. Many truck drivers and families stop by to visit the place and pray for their safe journey. See the bike and location where the accident happened. Pray for your safe journey. 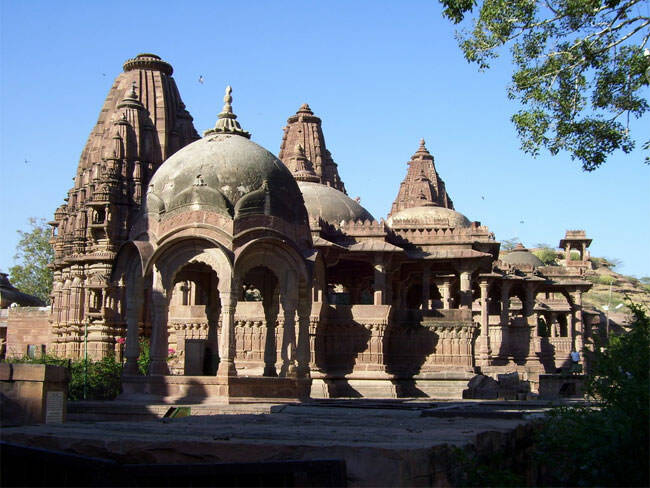 The Mandore gardens has charming collection of temples and memorials and it’s on high rock terraces. The gardens house the Chhatris (cenotaphs) of many rulers of the state of Marwar. 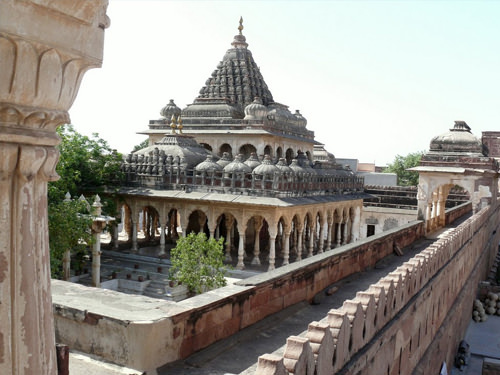 The Mandore Gardens also house a government museum, a ‘Hall of Heroes’ and ‘the temple to 33 crore Hindu Gods’ (The temple of 330 million Hindu Gods). There is a temple of 330 million Hindu Gods, so you get to know the Hindu system. It’s an ancient temple located at the Sandstone Hill. Its local name is Pahadi Ganesh Mandir. Lord Ganesh is worshipped by all the localites and visiting the temple on Wednesday is considered holy. It’s located at uphill at Ratanada. Upside view is really nice and you can capture the whole view of Jodhpur here. You can take the vehicle up and there is a lot of parking space. You should repeat the mantra ‘Ganpati Bappa Morya’ here. Lord Ganesha is the father of Santoshi Mata. In Jodhpur there is a very old and famous lake, which is surrounded by mountains and is named as Lal Sagar Lake. Here is a natural ancient temple of Santoshi Mata fulfilling the desires of all. This temple is surrounded by various kinds of trees. In India, this is world class age old natural shrine, which has amazing specialty. The mountain is elevated on santoshi Mata temple as if Sheshnag (a kind of snake) is giving its shadow to Mateshwari. There is an Amrit Kunda close to temple where an old tree is in the same shape from many years. Near that tree there is very lovely waterfall. Visit this temple for your peace of mind and spirituality. This is said to be world class age old natural shrine with incredible speciality. There is an Amrit Kunda close to temple where an old tree stands in the shape of Lord Sheshanag. There are footsteps of the goddess, one is full size foot print and other is partial. Everyone takes darshan of the foot prints of the mother. This is place where Maa Santoshi has given Prakat Darshan to one of her devotee about 40 years ago. This place is too much crowded on Fridays as this is the day for the goddess. Sardar Market is a full of busy Indian market containing riots of sight and sound. The clock tower (Ghanta Ghar) in the center of Sardar Market is a useful reference point (if you lose your way refer to it and start again 🙂 ). You can spend hours in shops chatting with friendly owners who will offer a cup of masala chai (tea). This is the true highlight of Rajasthani hospitality. You will find Jodhpur to be full of amiable and kind people who will be quick to offer you chai (tea) as a symbol of genuine hospitality first and foremost (not at all an attempt to coerce you to buy). It is not uncommon for them to turn their shop upside down to show you all of their goods and many are quite proud of their businesses. Good place to enjoy street food and road side shopping. Stuffs are available at very reasonable prices. You will get plenty of opportunities to click the shot. You can find fresh food, traditional Indian clothing, jewelry and other goods, souvenirs, crafts. It is an artificial lake. It receives its water from Hathi Nehar (English: Elephant Canal), which is further connected to the Indira Gandhi canal. The natural vegetation here mostly consists of Babool trees (English: Acacia Nilotic), and various migratory birds such as Siberian cranes are seen here in the winter season. The city of Jodhpur and all the surrounding towns and villages depend on Kaylana Lake as a source of drinking water. Boating experience in the Kaylana Lake is incredible. If you are a natural beauty lover, then this place is made for you. You can swim if you would like to. In rainy season this place seems like heaven. Restaurants near Kaylana Lake make it enjoy more freely. Foreign birds in winters make it very beautiful place to visit. Machiya Safari Park is developing which will add more natural scenes to it. The Jaswant Sagar Dam lies in Pichiyak village between Bilara and Bhavi of Jodhpur district. The water from Jaswant Sagar Dam is utilized for irrigation purposes in Jodhpur. The greenest part of Jodhpur receives water from this dam. Boating facilities for tourists are available in this Dam. It is nice place for those who love boating or wading around in water. Good as educational trip for the children. It is a place for those who love boating or wading around in water. Sardar Government Museum is located in Public Park (Umed Garden). It was established in 1909 and formally opened to public on 17 March, 1936. The museum is named after Maharaja Sardar Singh of Jodhpur. Timings of this museum is from 10 AM to 4 PM and it is closed on Friday. Entry fee is only Rs. 10. The collection of this museum consists of 397 stone sculptures, 10 inscriptions, 1951 miniature paintings, 12 terracotta, 32 metallic objects, 178 arms, 111703.5 coins, 4107 miscellaneous objects displayed in Archaeological Section, armory, art & craft and historical section. It is a popular garden of Jodhpur. Umed garden was developed by Maharaja Umed Singh. It was named after him. The garden has five separate gates around it to facilitate entry to the garden from different directions. It has green lawn with beautiful roses and other flowers. Inside the garden is a museum, Ashoka trees, artistically designed fountains, a library and a zoo. The zoo houses different types of birds, local, African and Australian parrots, ducks, rabbits etc. All the birds and animals are kept in their natural environment. Zoo and museum makes it interesting to visit this park. Great place to click photographs. MahaMandir is a famous temple in Jodhpur. The temple was built in 1812. MahaMandir Temple is supported by 84 pillars. It contains detailed designs and figures of gurus describing various postures of Yoga. It is located at a distance of 2 km from Jodhpur on the road towards Mandore. Now a school is run in the premises. In the premises of the temple, there are many ancient shrines and houses that reflect intricate works of stone. If you are a fan of Yoga (who is not 🙂 ), you will love this place. It is a famous market of Jodhpur. It is a cloth market that resembles Delhi’s famous Chandni Chowk. You will find Marwari style shops, where one has to sit on floors and bargain with the shopkeepers. Jodhpur is famous for its lahariya bandhini apparels and traditional footwear. You can shop here for local Handicrafts and Textiles, Kurtis, Churidar, Sarees etc. Choices are plenty and the prices are even better. You can find items for at least half the price at Delhi. Very big market to explore. Very good prices with so many options. You can always bargain further. 25 places to visit in Jodhpur to Enjoy like never before. But for this list to help you, you need to take action on it. I encourage you to pick at least one place from this list and put 100% of your resources to enjoy and explore it. Do report back here with your results :). Note: If you are in hurry and don’t want to miss anything in Jodhpur, then read this article ‘Top 10 Jodhpur Tourist Places and Attractions’ for quick guidance. And read ‘Things not to do in Jodhpur‘ to avoid voileting cultural practices. Your article on Jodhpur is not only very beautiful, but also very much useful for those who are planning to visit Jodhpur very soon like me. I would really love to visit all the 25 places described by you. Thanks for sharing such wonderful information about Jodhpur. And yes all these places are must watch. Great article Pankaj. Great insights into some of the lesser known places in Jodhpur as well as the well known. Definitely a must read before visiting Jodhpur. It will help readers plan the trip better. Cheers! Hi Priti, Thanks for your comments. Your comment means a lot. Cheers! Pankaj, this is a brilliant article, very resourceful and well executed. Keep it up. you really write so well i’m also writing blog on earthy explorers where i write about different places of india. Good information about the amazing Places to visit in Jodhpur. good information…..best blog…. I will definitely use this info for my upcoming trip to Jodhpur this month. Although its a short trip but we will try to explore few places. Thanks for the effort you put into this. I will be visiting Jodhpur for 10 days in March, this has helped me a lot ! Thanks for this thorough description. You’ve compiled some really amazing places. Although, you really need to add Ajit Bhawan, India’s first heritage hotel to the list. I will add your hotel the next time I update this page. Thanks! Hi Finian, thanks for the great tip. I am happy you found my guide useful. Cheers! This was really helpful for my project. Keep on writing. Your article is excellent extra-ordinary. Fellow-youths of our country should emulate your example to highlight their respective places. THANKS a lot. In fact your article has inspired us to visit your godly place early next year, say by Feb 2018. Can u suggest a reliable and reasonably priced mode of transport to visit these places of interest? Both me and my wife are Sr. Citizen. Thank you very much for your encouraging words. I’m happy that I can be of assistance to you. Please hire a car or auto. You can find them outside bus stand or railway station. Assuming a good bargain, you can hire anyone for full 3 days for just Rs. 3000-3500. He will be there for you all the time. You can peacefully visit all the places and enjoy Jodhpur without hurry. Great information,thorough research,beautiful n apt words! !